The next few weeks are filled with events I am giddy about, and attending a talk and book signing with my culinary idol, Ina Garten, is at the top of my list. So much of what I know about cooking and entertaining (outside of what I learned growing up in the kitchens of my mother and grandmother) comes from working through her recipes and watching her cooking show religiously. Garten’s relaxed, non-fussy attitude and presentation are big parts of why I love her, but it’s her recipes that seal the deal. I have never had one fail me. Ever. 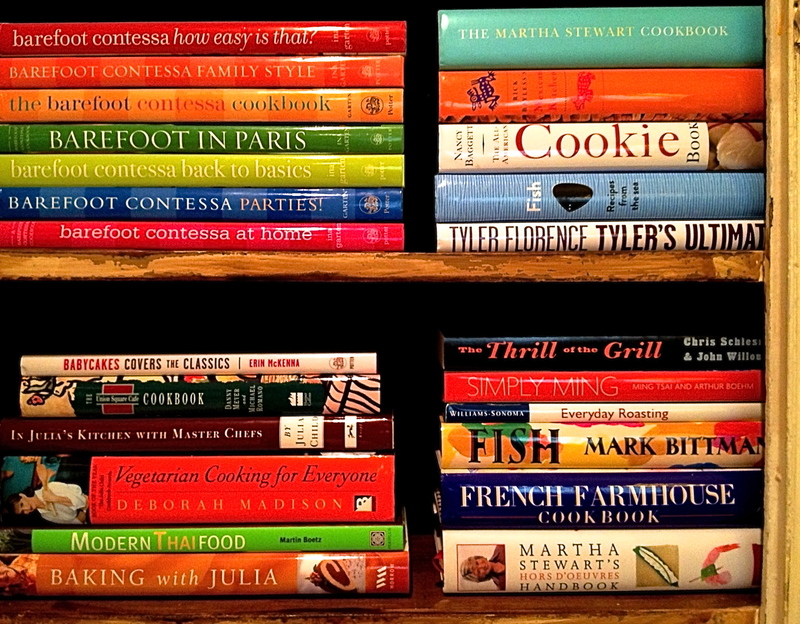 In honor of her new cookbook Barefoot Contessa Foolproof (coming out on my actual birthday – no better present than that! ), I thought I’d share my favorite Ina recipes. It really is impossible to pick a favorite. Coconut Cupcakes. Seriously one of the best things I have ever put in my mouth. 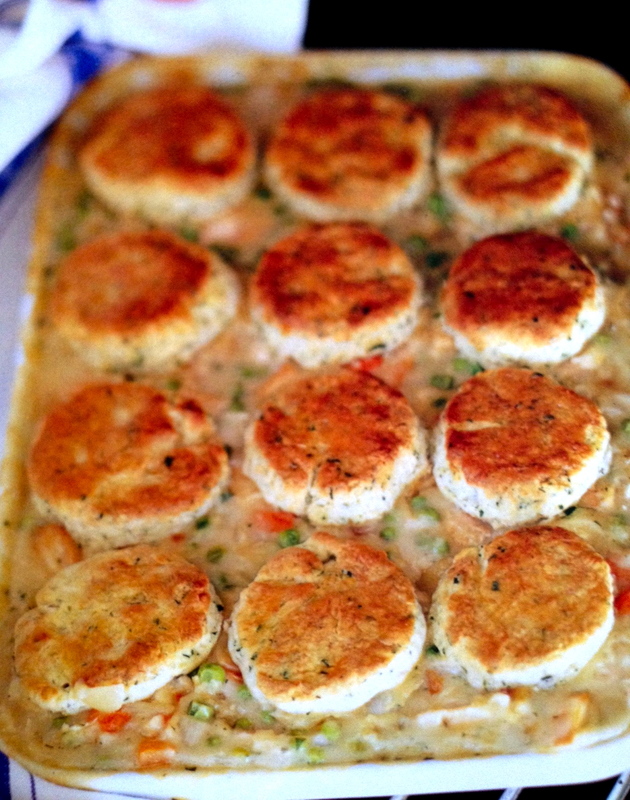 Chicken Stew with Biscuits, a family favorite. Roasted Salmon with Green Herbs. Special enough for company, easy enough for a weeknight dinner. 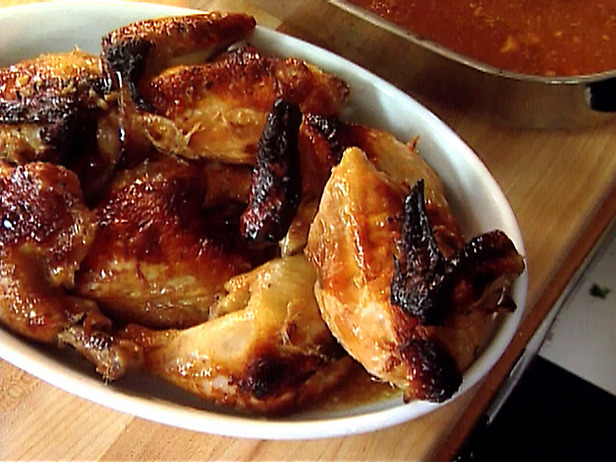 Indonesian Ginger Chicken. Garlicky, Gingery, and honey laden. Amazing with a simple coconut basmati rice and stir-fried broccoli. Lobster Pot Pie. The ultimate upscale comfort dish. Maple Oatmeal Scones. Breakfast heaven. Chipotle and Rosemary Roasted Nuts. Salty, sweet, and spicy – three of my favorite things. Chunky Blue Cheese and Yogurt Dip. This actually may be my favorite. I make it almost every time I entertain. And the leftovers are DIVINE spread on a warm steak sandwich. Can’t wait to get my hands on this book!!! Pre-order it here, and check here to see if she’s coming to your area on her book tour. And keep your fingers crossed for me that she is as lovely in person as she seems in her books. I’ll be devastated if she’s not! First image is of a portion of my cookbook cabinet, where her books take up quite a bit of real estate (dying to know what color the above jacket spine is!). All other images are from the Barefoot Contessa cookbooks. Purple. Has to be purple. I met her in SF at the release of her Paris Cookbook. She is lovely. Great post. Making her Perfect Roast Chicken tonight! one’s not mine. I also saved the kitchen spread she had in House Beautiful a couple of years ago when she was Kitchen of the Year (I think). Hope to have a kitchen as beautiful as hers one day!! !